I was learning to use interesting and exciting words when I write a recount. I think I used great words like freezing, boiling and deadly. I could make it better by adding more interesting words. I need to remember to use these words in my other writing too. I enjoyed reading your postcard, Mauriora. 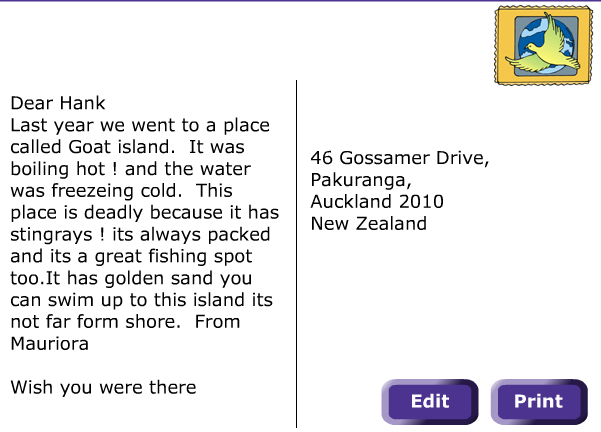 Goat Island is one of my favourite places too. I have taken some of my classes there and been out on the glass bottomed boat. My youngest daughter showed me today what happens if you touch a bluebottle jellyfish- it burnt her skin and still looks awful. Never touch a jellyfish even it is dead on the sand. What a great recount Mauriora. You have written a great description in a short piece of writing. Well done!